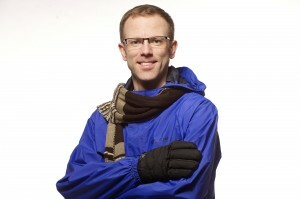 COLDEST AIR OF THE SEASON POSSIBLE NEXT WEEKEND? MAYBE! BUT WHERE? The following may sound like a foreign language, however, I will get to the bottom line at the very bottom. Today’s (Sunday’s) 12z weather models (Euro, GFS and several GFS Ensembles) are getting pretty close to spilling the coldest air of the season into the west next weekend. The trends are worth watching now since this has been hinted at for the past 4-5 days. It won’t be a prolonged event, but something to tease us perhaps? The MJO is forecast to swing into Phase 1, which is the best spot to be in for November cold in the Pac NW, as noted in one of the images below. The PNA is still forecast to fall off quite a bit as a result. The NAO and AO are also showing signs of coming down to negative territory in the latest ensemble forecasts. So, what is the bottom line? At this point I would say that odds are increasing that the coldest air of the season may penetrate the lower 48 states sometime next weekend. But where? That will become clear in the next few days. Right now it appears that models want to keep it in the west first, then slide it is east. That could change as we get closer. Either way, I think we are going to see a lot more blocking by next weekend and a good dose of Canadian cold to tap into for November. How cold? That remains to be seen, but at this point it WILL NOT be cold enough for snow in Portland/Vancouver! SPOILER ALERT! Click on any of these images for a larger view. Image #1 – 12z GFS model ensembles. Note several members are well below -9c temps. That’s plenty cold for November in Portland. Image #2 – 12z GFS model ensembles, in map format, showing the coldest air centered on next weekend. This is close, but not quite there for really cold air in Portland. Image #3 – The PNA (Pacific North American) index showing a drop off for next weekend, showing a trend for colder air into the Pac NW. Image #4 – The Madden Jullian Oscillation (MJO) index showing that Phase #1 is historically the phase that we want to see for cold November air to “seep” (I like that word) into the Pac NW. Image #5 – The MJO forecast for the next 10+ days showing a probable move into Phase #1. Image #6 – 12z Euro model showing a cool down in the west by next weekend. This will likely change as future models runs come in. 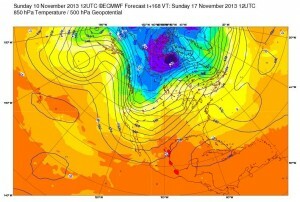 Will it shift the colder air east or more over the Pac NW? How far south will it slide into the lower 48? We shall see.